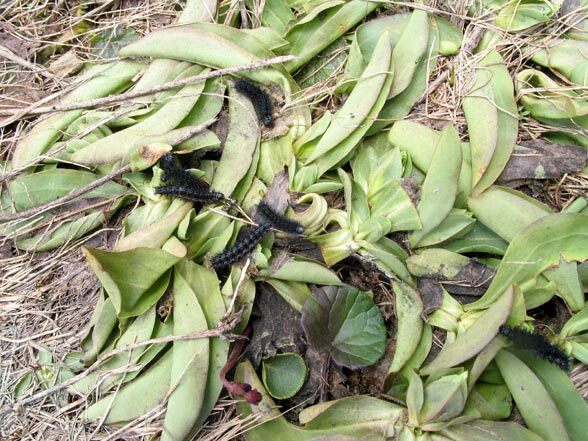 In the wetland area, the caterpillars live mostly on Succisa pratensis, in the alpine region on Gentiana punctata, Gentiana acaulis and other gentians and Scabiosa lucida. 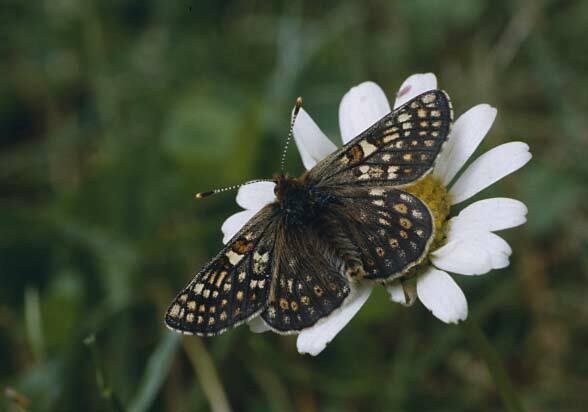 In the Jura, the species lives in its few occurrences mostly on Scabiosa columbaria. 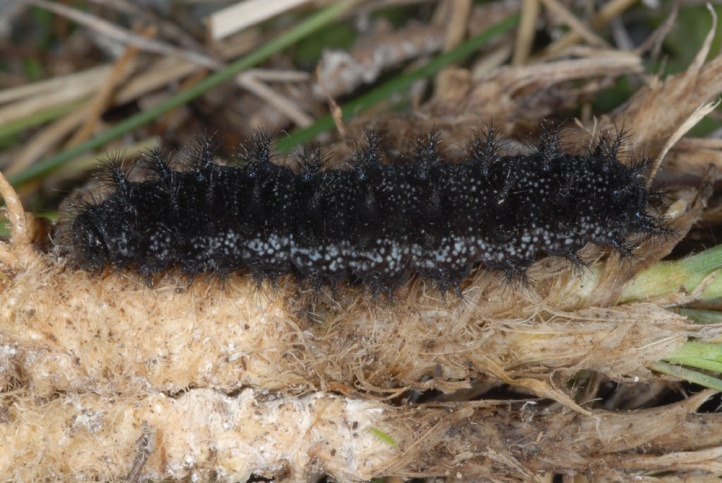 Further the larvae occasionally feed on Knautia arvensis where I watched defoliation on a seasonally wet grassland in the Ammersee area (southern Bavaria) in the spring, and Knautia dipsacifolia (seen in forest gap systems of the Allgäu region around 1500m above sea level). 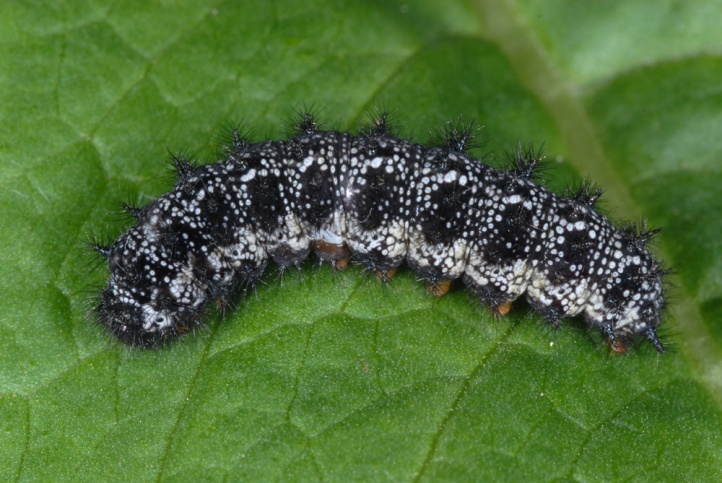 Rarely, also other related genera are used as Menyanthes or in parts of the range (Spain) Lonicera (Caprifoliaceae), which is summarized with the Dipsacaceae (Knautia, Succisa, Scabiosa) to the order Dipsacales. 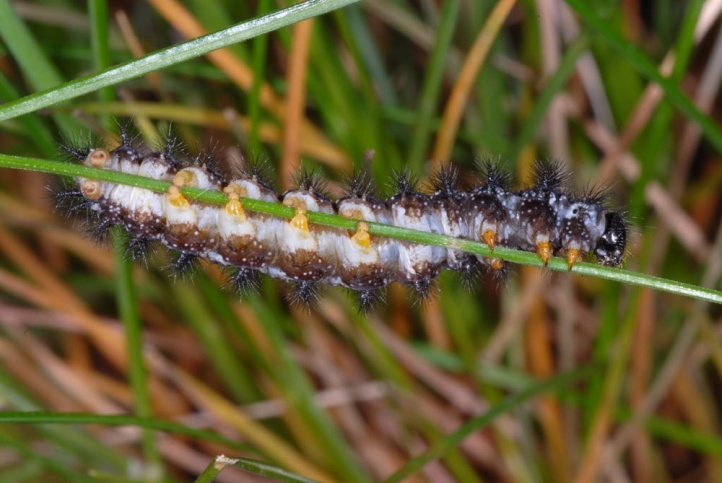 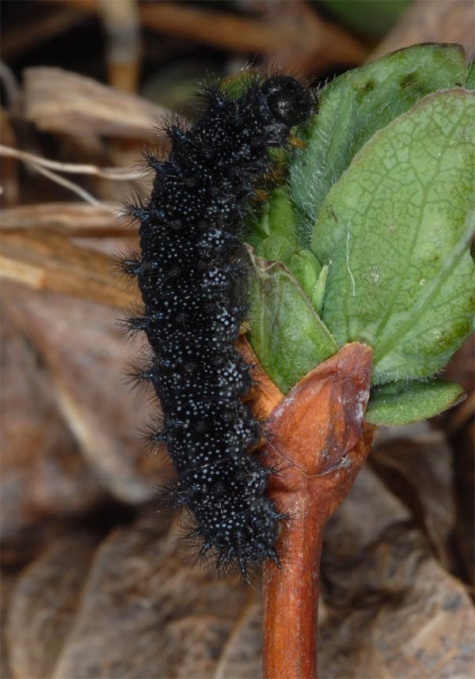 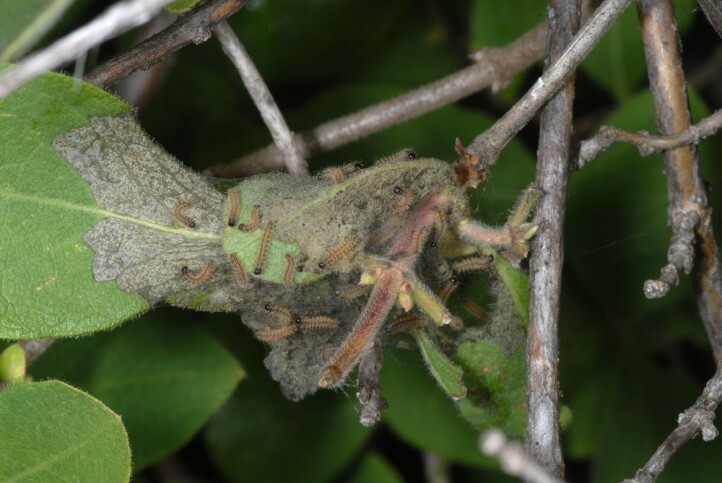 Interestingly, I found in May 2008 in the Engadine (Val Rosegg) at 2000m above sea level over 10 caterpillars that fed on the lower stems of Lonicera coerulea! 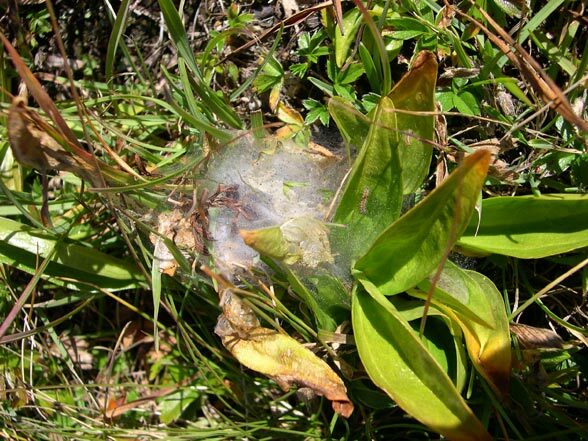 Gentiana could not be observed within a distance of several meters. 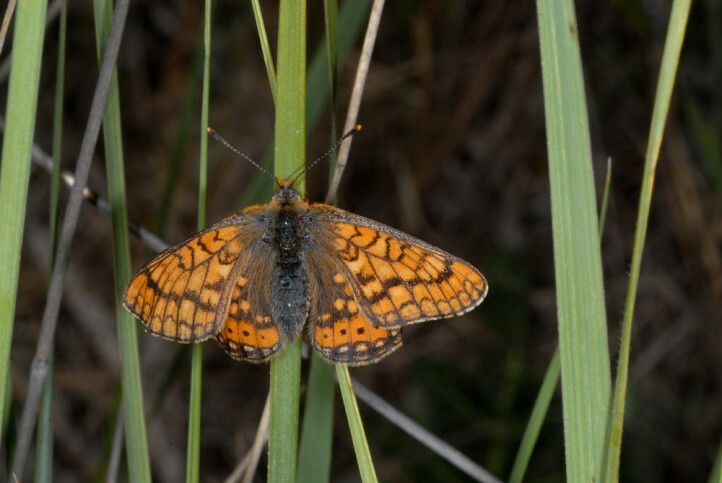 Euphydryas aurinia occurs in many types of open landscape habitats. 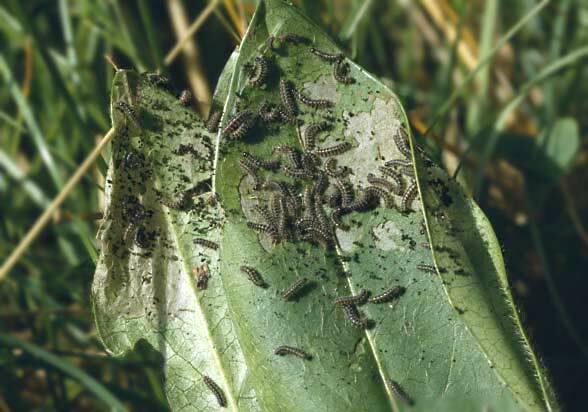 These all have in common that they are managed only very extensively and that they are not too rich in nutrients. 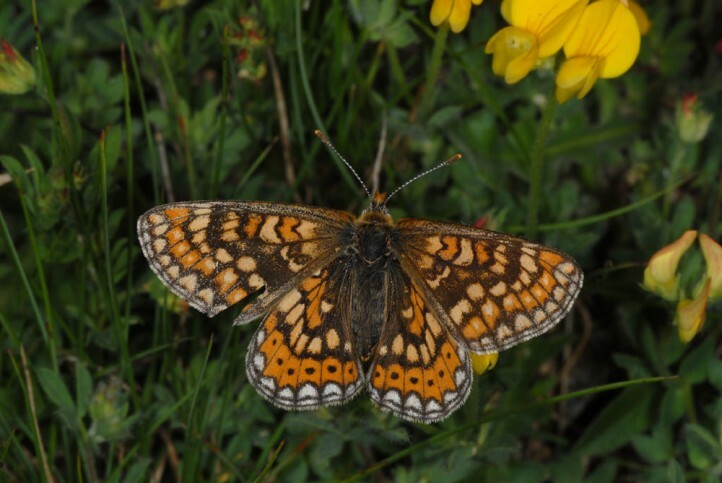 Probably Euphydryas aurinia colonized originally many extensive grasslands in Central Europe from the lowlands upt to high elevations in the Alps. 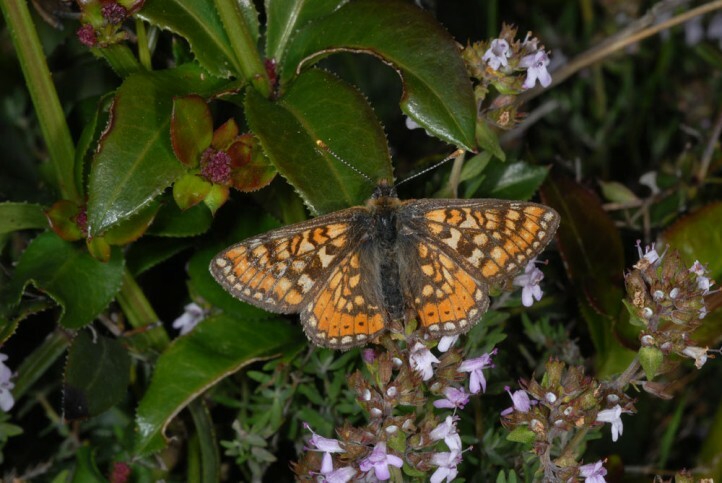 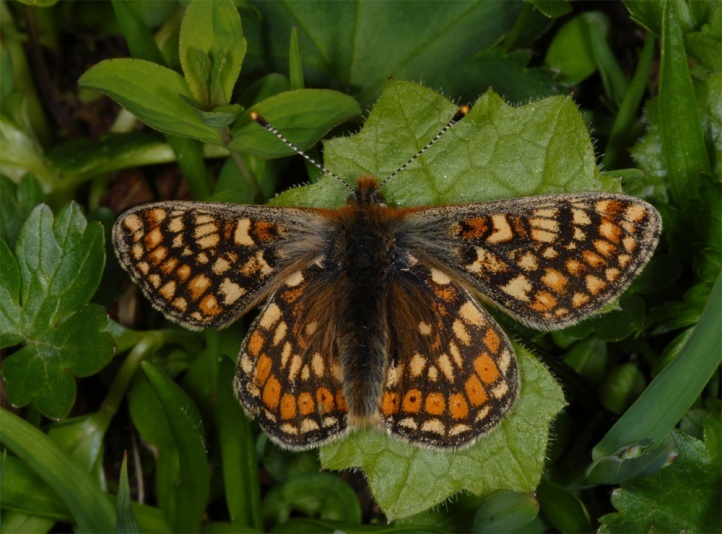 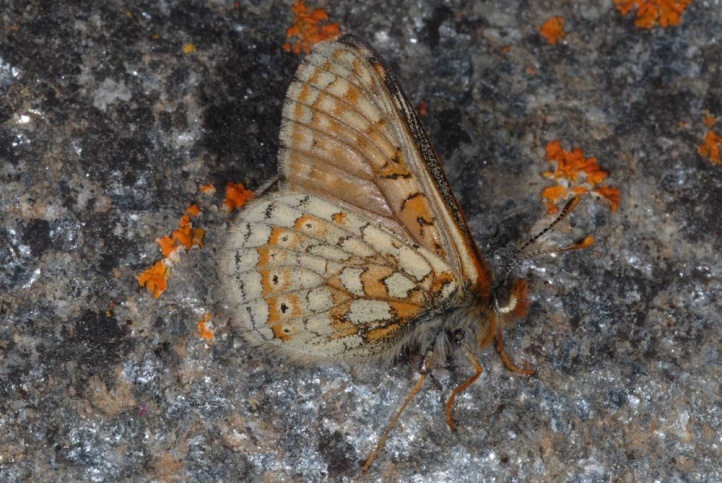 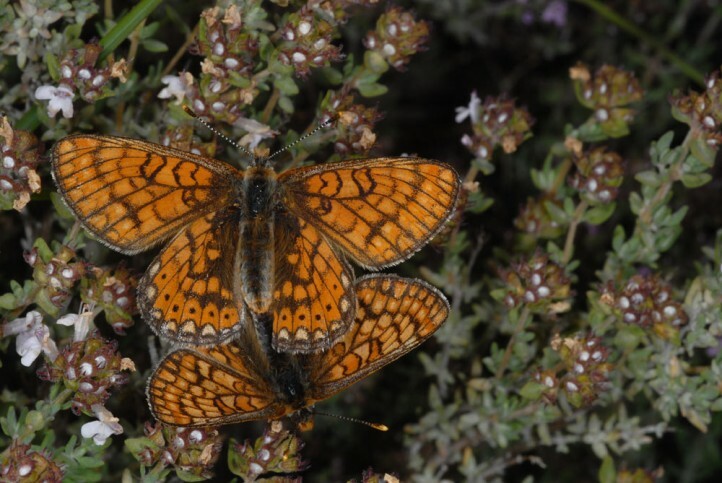 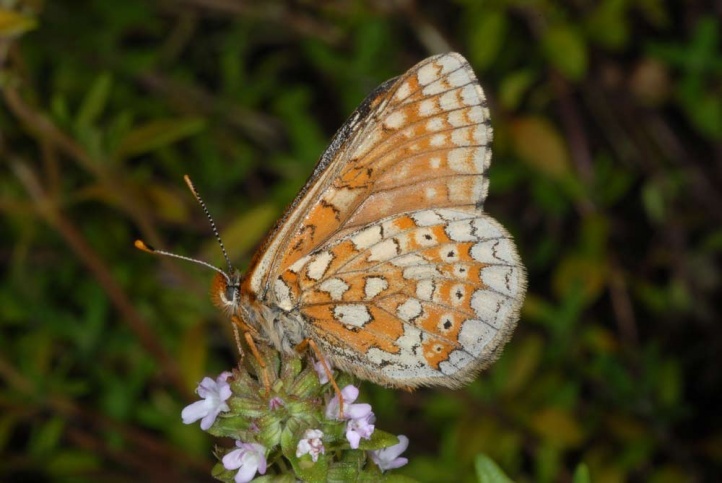 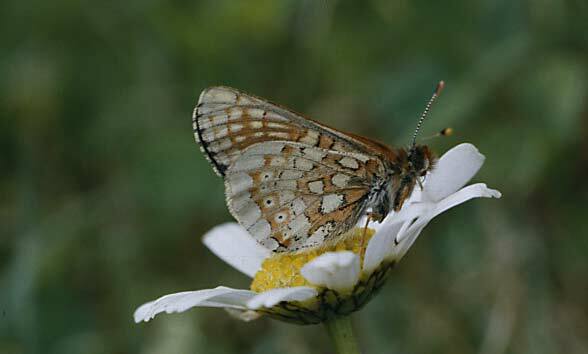 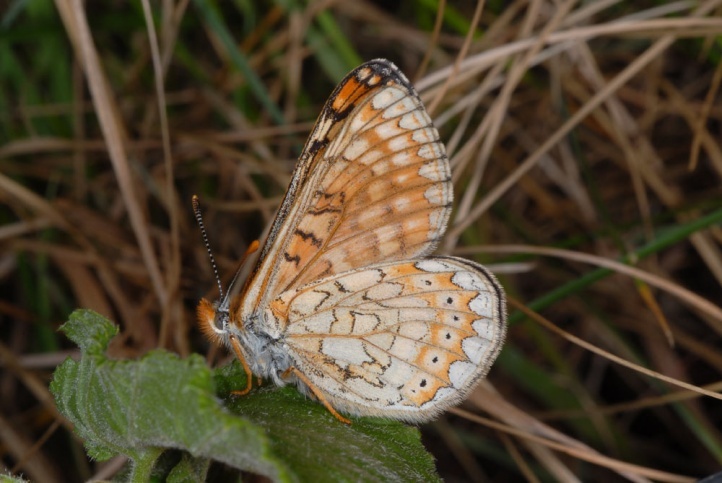 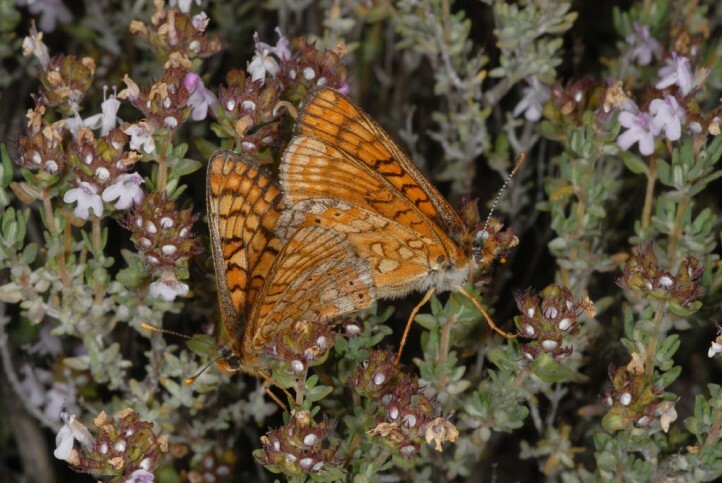 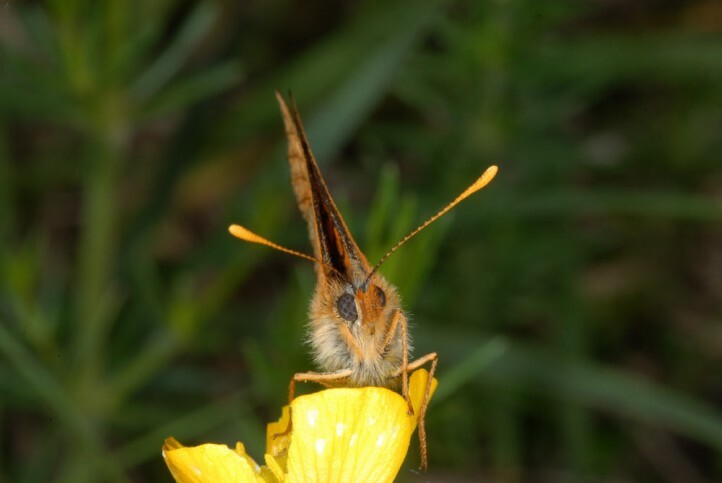 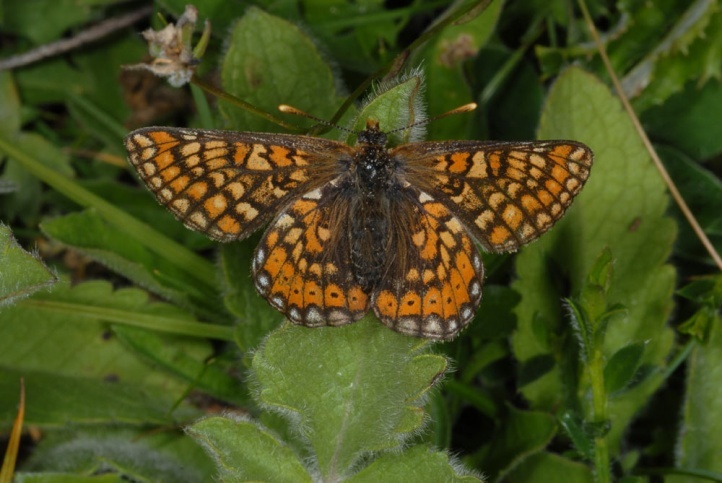 There fly smaller, darker and less scaly specimens that were formerly separated as a separate species Euphydryas debilis. 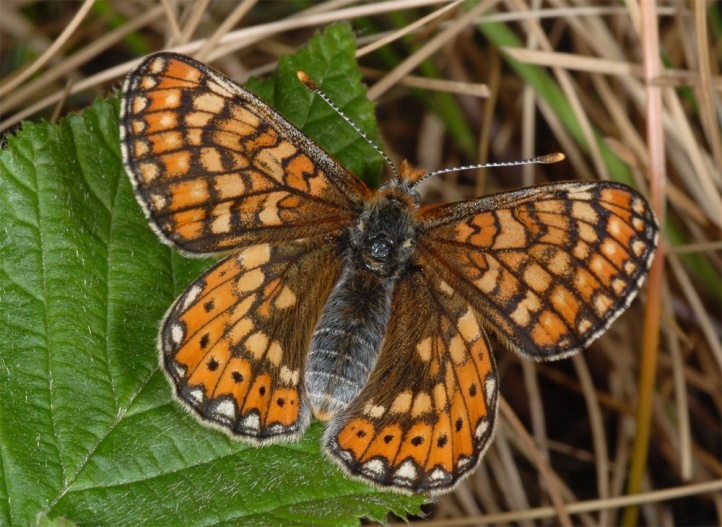 Today Euphydryas aurinia is pushed back to marginal sites like fens on the one hand and dry grasslands on the other due to agricultural intensifications especially in the lowlands. 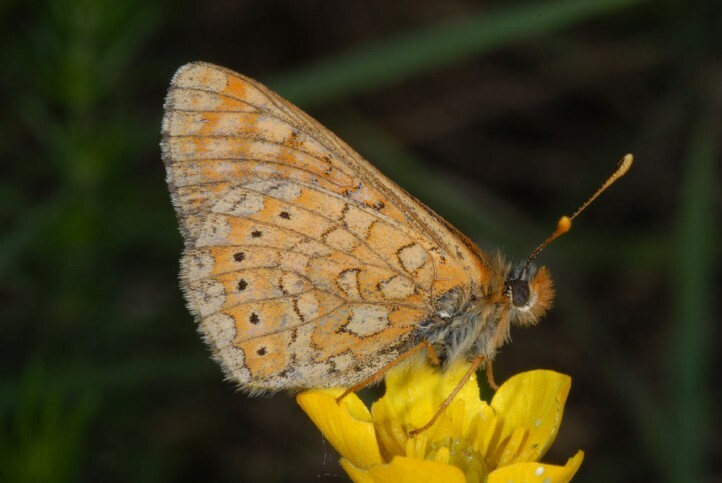 Euphydryas aurinia requires only moderate high growing, not felted areas for development and avoids on the other hand also very low growing and intensively grazed areas especially in the lower elevations. 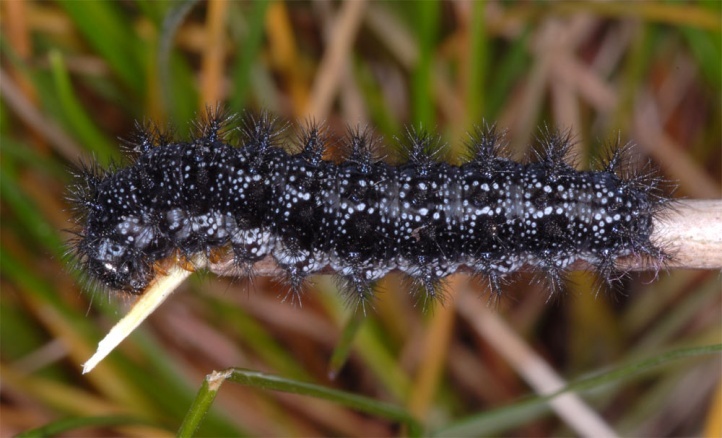 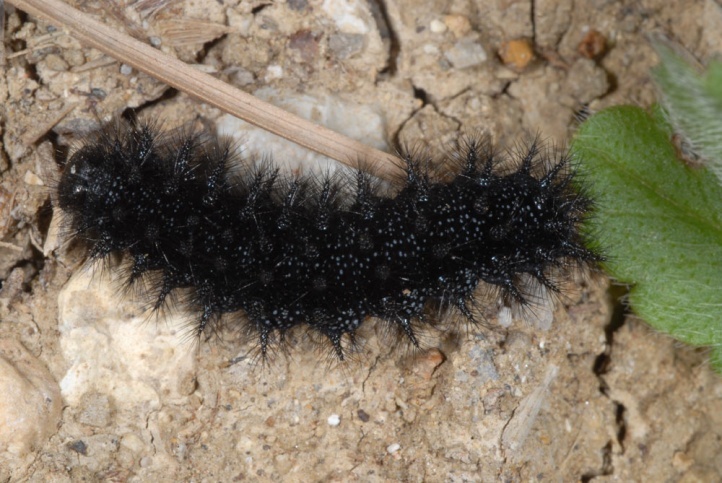 The caterpillar overwinters often as L4, rarely also as L3 (especially in the mountains). 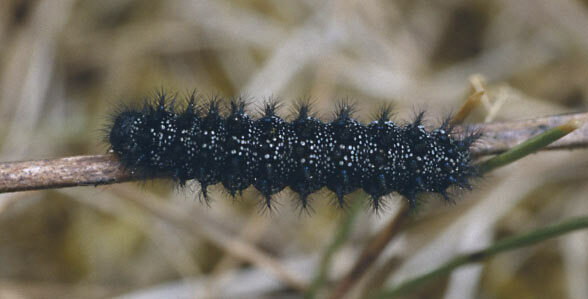 A repetitive, second overwintering of the caterpillars occurs partially in the plains and more often in the mountains. 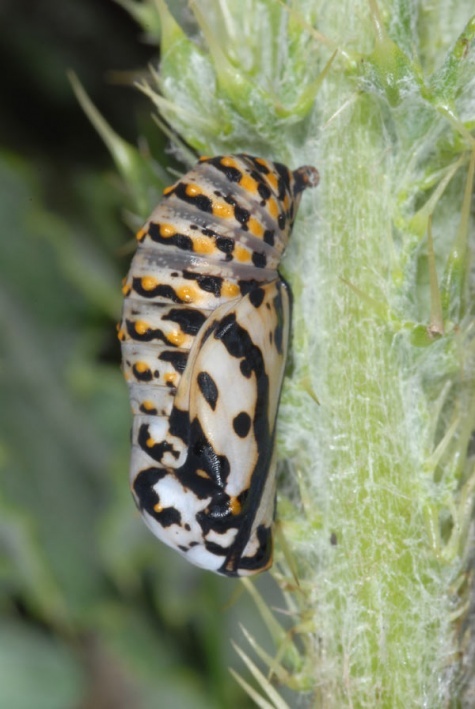 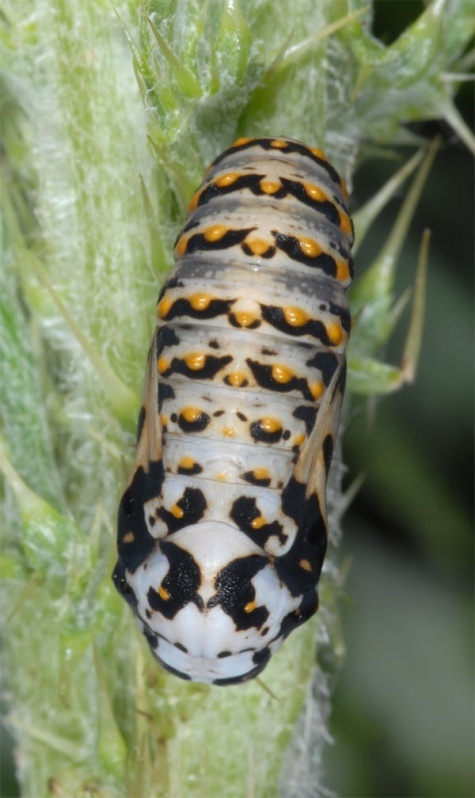 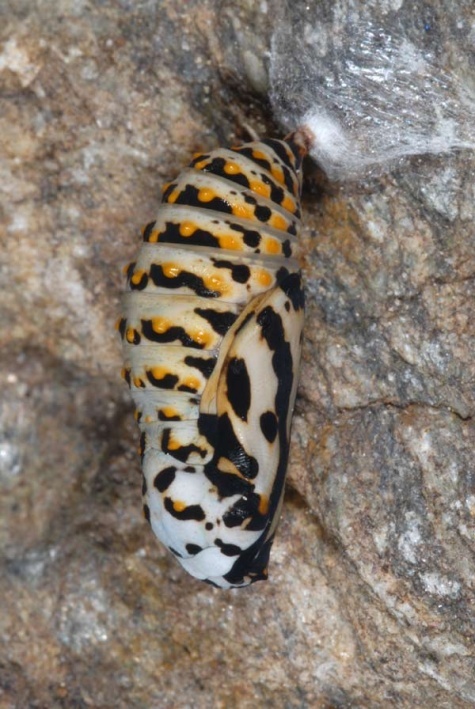 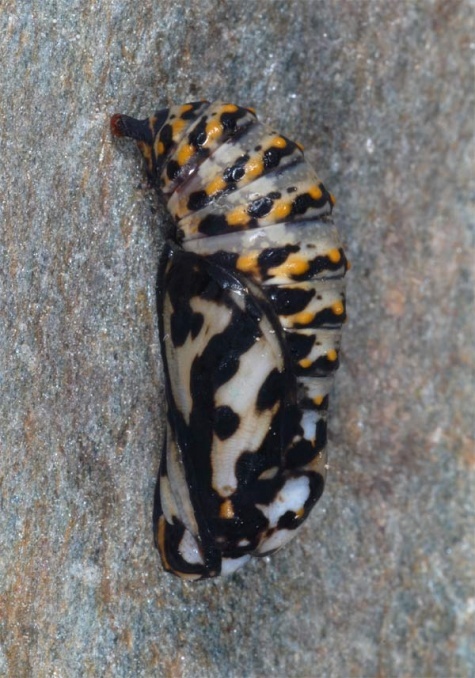 I found caterpillars and later pupae in the plains between March and May, in the mountains as late as early July. 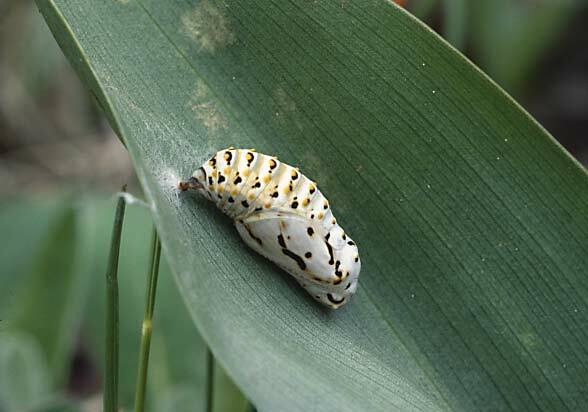 The pupae were often attached to the leaf upper side of Colchicum autumnale in a habitat. 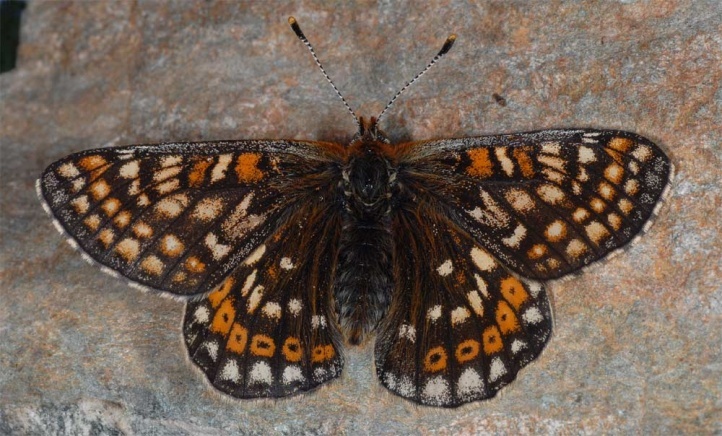 The adults fly from May to early July, in the mountains until August. 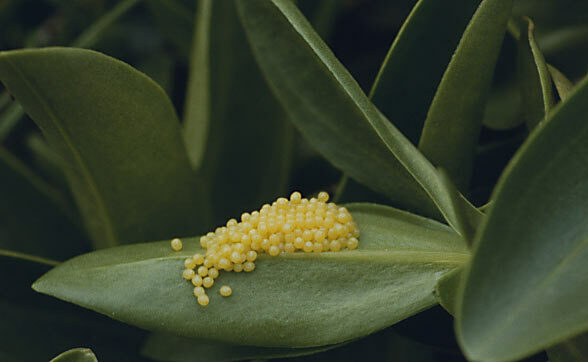 Eggs are laid in clusters on the underside of leaves and was observed the author on Scabiosa lucida (Allgäu Alps), Succisa pratensis (Allgäu) and Gentiana acaulis (Swiss Alps). 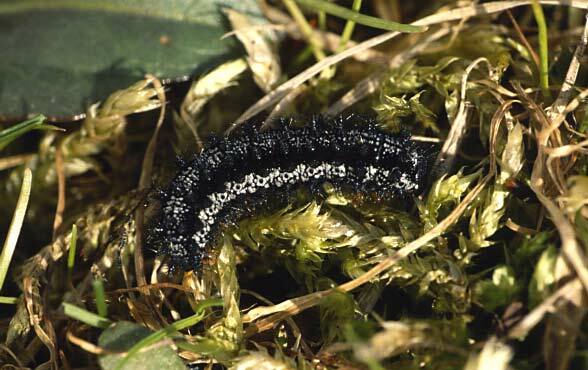 The young caterpillars and its webs are conspicuous in August/September on the plants. 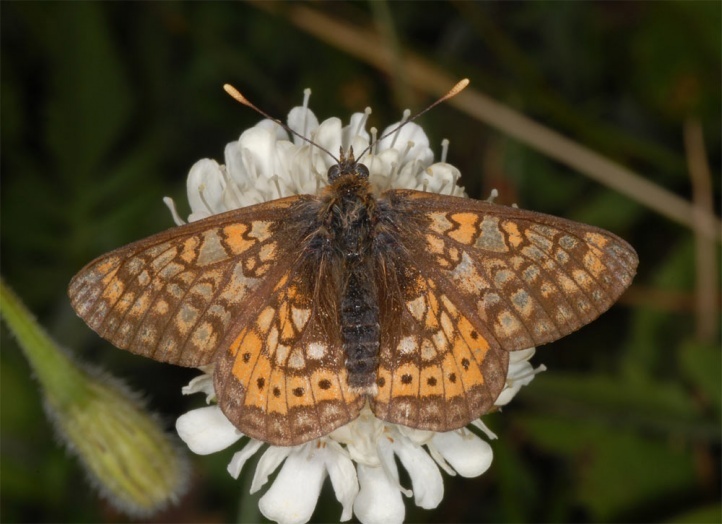 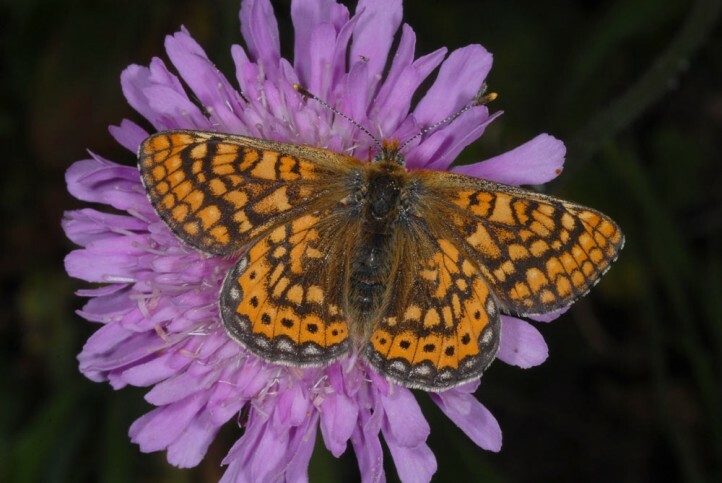 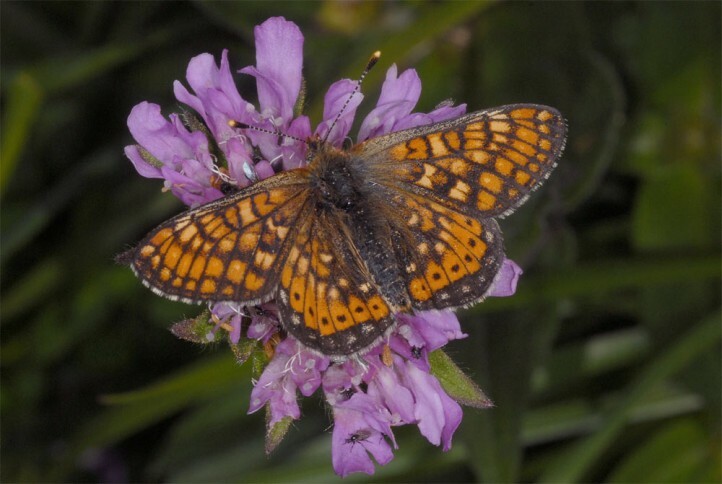 Euphydryas aurinia is in very stron decline especially in lower and medium high elevations due to habitat loss because of intensification, afforestation, improper maintenance and isolation. 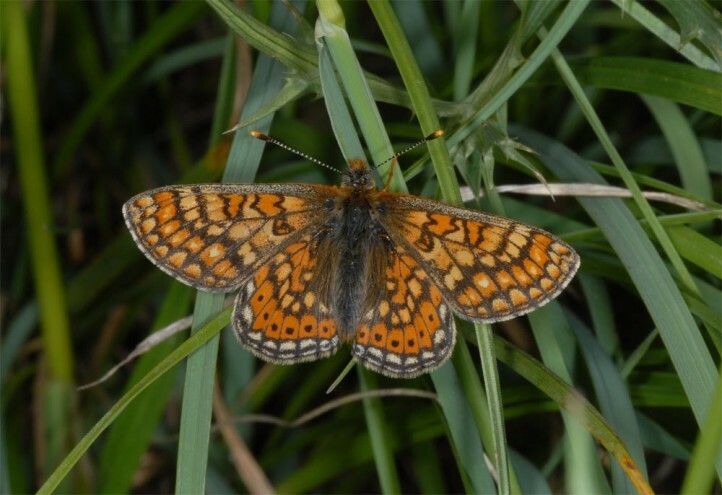 This species tolerates neither a too intensific grazing nor abandonment of extensive maintenance (late mowing once in autumn) for longer periods. 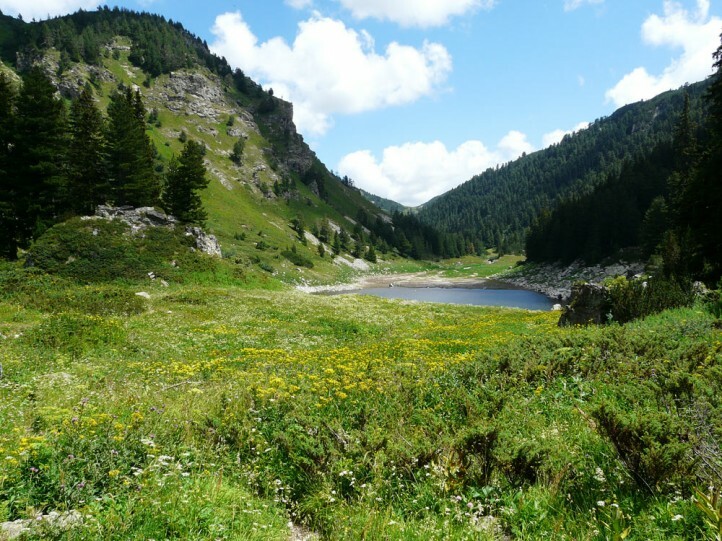 The decisive factor is the correlation with the natural growth vigor of the habitat, i.e. 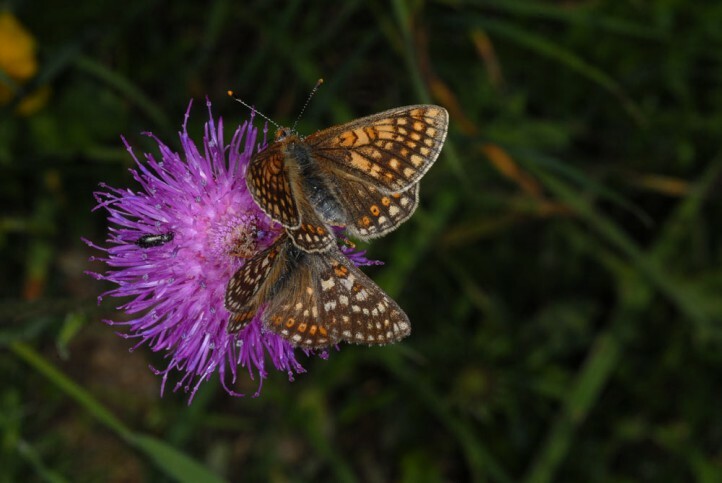 weakly growing sites should not be mowed annually, but strong growing and more nutrient-rich sites should. 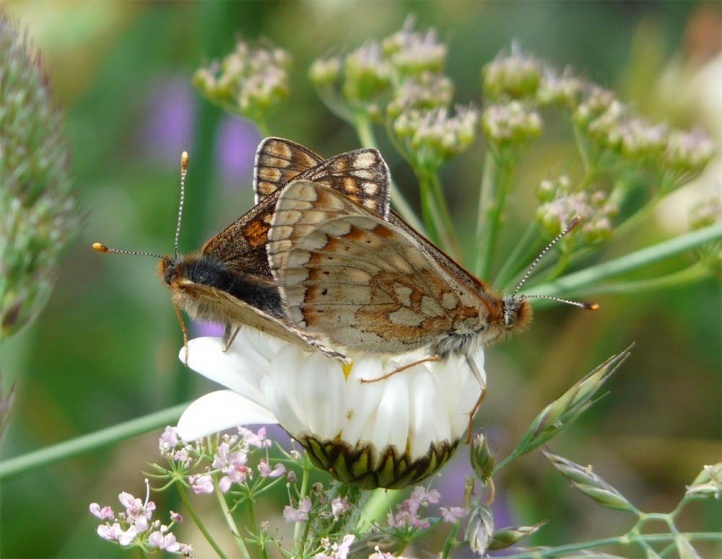 Changing fallow areas should be included in every habitat. 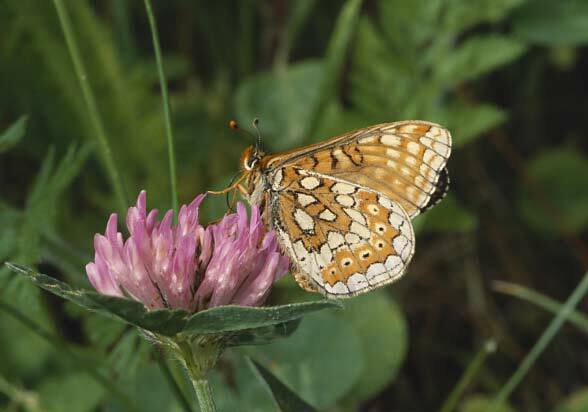 Best would be a mowing after mid-September on fen meadows (Molinietum etc.). 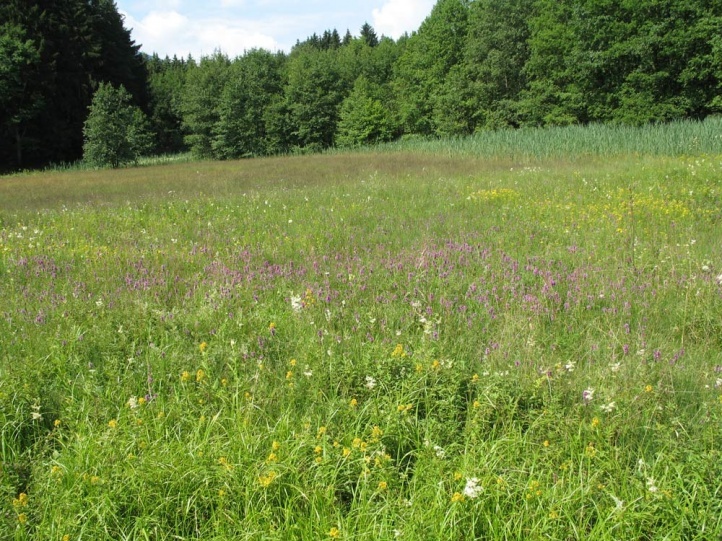 On vigorous sites a complete mowing even with rotary mowers can be tolerated under certain circumstances, at least in vital populations (A. Nunner personal information). 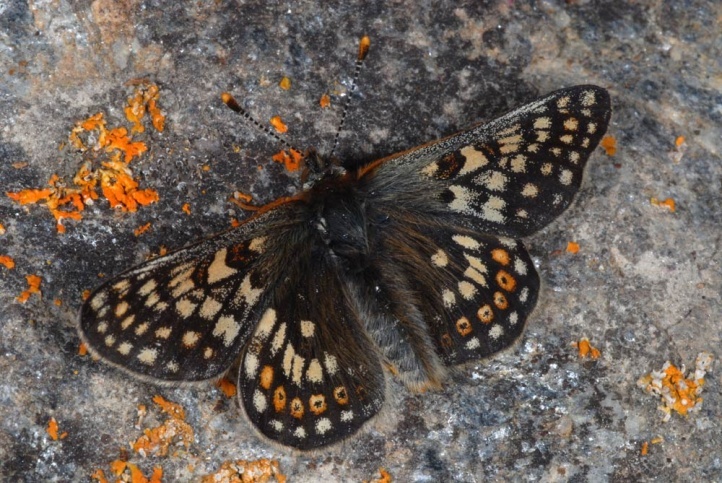 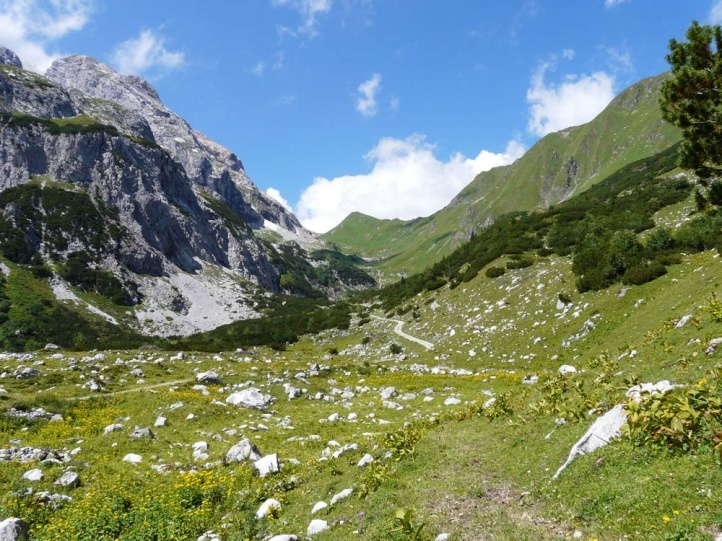 In the Alpine region, Euphydryas aurinia is currently common and widespread in almost any mountain range (Southern Germany, Austria, Switzerland). 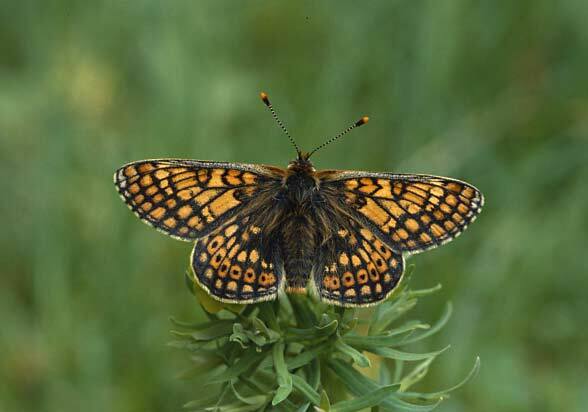 The distribution extends from North Africa across Europe and temperate Asia to Korea.